The accumulation of odds and ends of bar and rod is inevitable with any lathework, but rather than throw them into an ever-growing scrap-box, why not turn them into useful little tools to simplify and speed up future work? 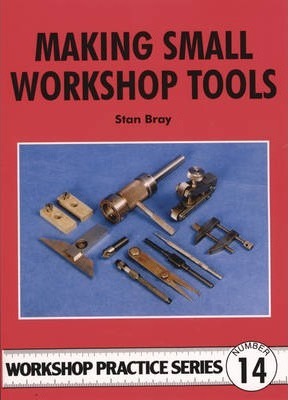 In this book Stan Bray describes twenty-two simple but useful adjuncts to the tool kit for bench and lathe use, none taking any more than 3 to 4 hours or involving special materials, yet each able to save considerable time in use as well as aiding accuracy. You may not see an immediate need for some of them, but once made it is surprising how often they will be used. There is also the satisfaction of turning what might have been wasted into something useful and the knowledge that money has been saved. Part One: Marking Out Tools - Scriber. Punches. Calipers. Rule Holder. Scribing Block. Engineer's Bevel. Centre Square. Trammel. Part Two: Benchwork - Drill Clamps. Filing Plates. Small Hand Clamp. Pin Chucks. Toolmaker's Clamps. Tap and Die Holders. Part Three: Lathework - Flycutters. Rose Bit. Box Tool. Knurling Tools. Filing Rest. T-Bolts, Dogs and Jacks. Bolting Bars. Simple Indicator. Stan Bray is a model engineer and author of wide experience including editorship of the magazine Model Engineers' Workshop and has written many books covering subjects from clock making to machine shop techniques.